Many of us were caught off guard by the recent announcement of NASCAR’s tough new policy towards drivers and teams whose cars are found to be cheated up…or shall we be politically correct and say “legally challenged” after a race victory. For those of you haven’t been following the latest racing news (and admittedly with Jayski’s page shutting down last month it’s been more difficult) or perhaps those still semi-comatose after having been bored into a stupor by the Super Bowl, here’s the Reader’s Digest version. If a winner’s car is found to be illegal after a race, that driver and team will be disqualified. They will officially be listed as having finished last in that event. They will not be awarded prize money and more importantly they will not receive any points. They won’t even get to keep the trophy. A lot of fans, including myself to an extent, feel the move is long overdue. More than once I have been hard-pressed to explain to casual fans or non-fans of stock car racing how a car could be found illegal in post-race inspection, but the driver still gets to keep the trophy and the big check, not to mention those points. It simply defies common sense. Perhaps things have swung too far in other sports where bicycle racers or Olympians can have their wins and medals stripped away years after the actual event. Certainly, one would hope this new policy won’t end up with an unseemly debacle like the 1981 Indy 500. For those who might now have been following racing, (or perhaps not even been born yet) Bobby Unser took the checkered flag but the next day USAC (is USAC still a thing?) decided Unser had advanced his position under caution. Unser and his team appealed their demotion to a second-place finish. It was in a court of appeals, not on the racetrack and on October 9, more than four months after the race. As a side note, it took even longer to settle a lawsuit filed by legendary racer AJ Foyt against reporter Robin Miller and the Indianapolis Star (the paper Miller wrote for). Miller accused Foyt of cheating both in practice leading up to that year’s 500 and throughout his career. That suit didn’t get settled until November of that year when the Star issued a retraction of the story and Foyt dropped the lawsuit. So I’d urge my fellow NASCAR writers to run any story you write accusing anyone of cheating by the legal staff, first. Calling someone else a “cheater” has always been fighting words anywhere from the diamond to the gridiron, from the racetrack to the playground. Back when I was in grade school upping the ante by chanting “cheater, cheater, pumpkin-eater” was throwing down the gauntlet. You were going to rock. Then, as now, when someone else is caught cheating red-handed and with no wiggle room, the most common excuse is “everyone else is doing it too.” It’s a less than clever or elegant defense in that it’s an admission that you knew what you were doing was wrong and casting shade on others for doing the same. One other side benefit of the new rules is that the term “encumbered win” will be shipped off to NASCAR’s eve growing “Hall of Shame,” presumably to sit on the roof of a Car of Tomorrow in the “stage racing” pavilion. Last year, two of Kevin Harvick’s eight wins would have been disqualified, and he’d he wouldn’t have made the cut into the championship without that one “cumbered” race in Texas. Some fans have voiced an opinion that NASCAR has gone overboard with the new rules. They point out legends of the sport like Smoky Yunick and Junior Johnson became legends for their “creative interpretations of the rulebook,” when they didn’t just flat out disregard the thing altogether like Junior did with the “Yellow Banana 1966 Ford Galaxie and Smokey did with the infamous 7/8th scale black and gold Chevelle. 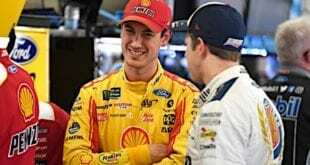 NASCAR turned a blind eye towards Johnson’s yellow car in hopes of getting Ford Motor Company to end their boycott of NASCAR racing. The Chevy was let slide in hopes of getting GM back into the game as well. Neither car won a race. Curtis Turner blew an engine in Yunick’s Chevy, and Fred Lorenzen blew a tire, smacking the wall in Junior’s funny car. Neither car ever returned to the track. I had the great fortune to interview Smokey Yunick late in his life and had the bad manners to bring up some legendary stories of his cheating ways. In his usual colorful and profane language, Yunick told me that he in fact was not a cheater. He’d come up with some new part or strategy that NASCAR had never considered until he made it work, at which point they’d re-write the rulebook to include new rules to ban those innovations. But he assured me that for every trick NASCAR did find, there were usually three or four more that they missed. Others point out stock car racing was by and large founded by men who also ran illegal moonshine liquor throughout the rural south, itself a clear violation of the law. Let me point out there’s a wide degree of separation between violations of rules and violations of the law. Nobody is suggesting Harvick should have been thrown in prison as a habitual offender after his second “encumbered” win last year. People tend to romanticize moonshining from that era while in fact it was a deadly business. Real moonshining was no more like the Duke of Hazzard than a Brady Bunch tickle-fight was like a barroom brawl. A lot of young men, desperate for money lost their lives in the trade and they left behind perhaps a fistful of cash and a pretty young widow. Thunder Road might be the greatest rock song ever written, Thunder Road was a truly fine film, but making your living on the real Thunder Road was a tough way to earn a paycheck. It’s also worth noting that the “golden age of cheating” in NASCAR was a long time ago, in a world very different than the one we live in. It wasn’t until Winston got involved with NASCAR’s top divisions that race wins routinely paid out over $10,000. The year-end championship also ratcheted up the prize money available to drivers and teams substantially. In 1971, Richard Petty competed in 46 of 48 races, winning 21 of them. Obviously, he won the title and his yearlong earnings were $351,071. In 1972, NASCAR shortened the Cup schedule to 31 races at Winston’s request. Petty ran in all 31 races and won eight times. He earned $339,045. For comparison’s sake, Jeff Gordon finished fourth in the 2014 Daytona 500 (a race in which he never led a lap) and pocketed a check for $736,800. The huge money involved may have done the sport as much harm as good ,but it certainly has changed what’s at stake for a team or driver willing to push the rules beyond the snapping point. It’s one thing to place an illegal wager on the daily number at the local newsstand and walk away with 500 dollars in your pocket. It’s another all together to rob a bank. Besides the purse money, drivers also receive huge salaries in today’s Cup racing. The difference between keeping gainfully (and lucratively) employed and getting let go by a team-owner still comes down to winning at the end of the day. A driver who wins gets the honors, while the driver who would have won the race at the wheel of a legal car gets the shaft. That brings me to another point. Obviously if a car is disqualified after an apparent win, it’ll be the driver who is branded a “cheater.” But there’s two types of cheating. What was Kevin Harvick supposed to do last year at Las Vegas Motor Speedway? Was he expected to jump up and down on the roof and rear window of his No. 4 car to ascertain all the correct braces were in place and nothing flexed more than it was supposed to? Contemporary Cup drivers typically have nothing to do with building the cars they race and in a lot of instances, I’m not sure some of them would know which end of a screwdriver to grab on to if they tried to lend a hand. Throughout the checkered (pun intended) history of cheating in NASCAR, there has been a second kind of cheating. Nitrous Oxide became a bit of a scandal for a while. Journeyman racer DK Ulrich got involved in savage wreck at Darlington Raceway that sheered away the sheet-metal from his rear quarter panel. The damage revealed a hidden nitrous oxide tank tucked away out of view. Nitrous oxide is a gas (the so-called “laughing gas” your dentist might use on you). Extra molecules of oxygen in the gas can be combined with extra fuel squirted into the intake manifold of a race cars engine to produce a dramatic spike in horsepower, often in the 100-150 horsepower range at the touch of a button. Because of the size restrictions of a nitrous tank that needed to concealed in the car, obviously a driver and car couldn’t run nitrous for an entire 500-mile race. The driver would need to depress the button to arm the system when he needed to make a quick pass or perhaps on a qualifying lap. Because of the short duration of the power boost, nitrous was ideal for qualifying and one year I believe the top six qualifiers for the Daytona 500 were all either caught with nitrous tanks or agreed to forfeit their times to avoid having their cars re-inspected. But with nitrous, the driver of the car had to arm then the system and then push the button when he wanted the extra power boost. Unlike Harvick, who very well might not have known his car was illegal a driver pressing that nitrous button knew it was against the rules and he was cheating. Darrell Waltrip’s legendary Chevy Monte Carlo, Big Bertha, is another good example of an illegal car that the driver had to know about. 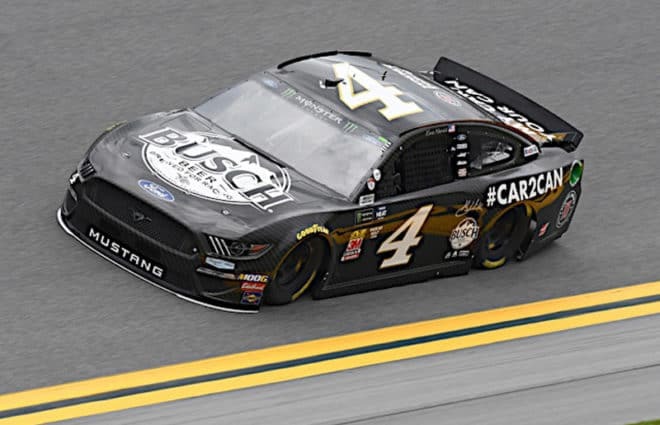 To make a car go faster, you can either add horsepower (as with nitrous) or you remove weight (or you tweak the aerodynamics which is what Harvick’s team did at Vegas last year.) NASCAR has a rule mandating the minimum weight of a Cup car. The team DW drove for, DiGard Racing, found a way to skirt that rule. They filled up the lower tube of the driver’s side roll-cage with lead shot. The car would roll through pre-race inspection at proper weight, but on the pace laps the driver (Waltrip in this case) pulled a chain that opened a valve on that same roll-cage tube, allowing the shot to fall onto the ground substantially lightening the car. Waltrip might not have designed the system, but in order for it to work he had to pull that chain to release the lead shot. The valve wasn’t opened from the pits by radio. Waltrip knew he was cheating when he pulled the chain. He even joked years later one morning prior to the race that he and the team got panicked. A NASCAR inspector had heard about their little weight reduction trick and was going to have a look at the car prior to the race. As Waltrip recalls the incident, he knew they were going to be OK when that NASCAR official shoved the floor-jack under the No. 88 car and lifted it might as the same point where the valve that spilled the pellets was located hiding it from view. Lucky? Perhaps. Cheating? Abso-damned-lutely. For all his pontificating about the importance of rules and the need to eliminate cheating in his day, Waltrip and some of the teams he drove for were among the biggest cheaters out there. After he was caught with a nitrous tank at that Daytona race, this is what DW had to say about cheating. My point here is that while the new penalties may be a more appropriate way to police the sport, they’re fine for a rules violation a driver was most likely unaware of prior to and during the race. If the driver had to be complicit in the cheating by arming a system, pulling a chain, sneaking a computerized device into the car or the like he ought to be suspended for the rest of the season just like Ulrich was 41 years ago. Ask any pre-Dr. Spock parent or an unruly toddler. For punishment of bad behavior to be effective that punishment must be swift, severe and certain. That’s what NASCAR is banking on. In any boxing match one fighter will win and the other will lose. It’s the same deal with stick and ball sports. But in NASCAR racing, each weekend one driver will win and the other 39 will lose. It’s a tough enough thing for a driver to lose a race, but if he feels that on that particular day another team either out-thought or outspent his team, and the winning driver made some brilliant moves behind the wheel while he left something on the table, that’s easier to accept than believing the other driver and team cheated and he had never really had a dog in the fight. Because in the first instance there’s a chance the next weekend the tables will turn, while in the second the only way to grab a win is to cheat as well and get away with it. Once NASCAR has convinced the drivers who finished second to 40th the winning car and driver were legal, then cheating will become a self-healing issue. My guess is before that happens someone will have to be caught cheating and made an example of. You might think a particular traffic light is unnecessary and useless and run through that intersection on a “stale yellow” frequently, but once you see another driver pulled over for running that light for the next few weeks at least you’ll likely brake heavily on a yellow light to avoid the same fate. Unless, of course, you live in New Jersey, and then there’s no helping you anyway. I do have my concerns that NASCAR plans to thoroughly inspect the top three finishing cars in a time span of 90 minutes so the race results can be made official. Given that time constraint and some of the complex technical issues that need to be resolved, my fear is corners will get cut at least occasionally. Some will argue given a decent amount of inspectors well versed in the technical subtleties of race cars that’s plenty of time to get the job done. Previously, NASCAR took cars back to the R&D center and inspected them over the course of days, not minutes. And sometimes the sanctioning body still messed up. In fact, any student of the sport will likely agree with the suspicion that NASCAR could screw up a two-car funeral in a town that has just one traffic light ….in New Jersey. I’m also a bit leery about the appeals process if a car is found illegal. Under the new rules, one NASCAR official will hear an appeal and his determination will be final, thus no further appeals will be heard. When advancing to the next round of the playoffs (until that unholy mess of a system goes the way of the Edsel) and a potential championship or a drivers career is on the line, I think there should either be a three-person initial appeals panel or a “one-last-chance” appeal could be made, though somewhat like in football, a team would only get one of those a season to limit frivolous reviews. Certainly we saw in this years NFL playoffs how a single official — no matter how well versed in the game or well-intended — can really screw the pooch and throw the whole postseason into disarray. Finally, I’d like to address the contention that this whole disqualification and more draconian penalties are somehow something new in NASCAR. It was in the Busch Series that Dale Jarrett was disqualified and stripped of prize money and points after he was initially flagged as the winner of a race at Michigan in 1995. In 1992, Jeff Burton took the checkered flag in a Busch race at Red River Valley speedway, commonly referred to as “Dublin” (Virginia not Ireland) but the rear differential in his Oldsmobile was found to be illegal and the win was taken from him. In 1954, NASCAR pioneer, Tim Flock, crossed the finish line first in the February Daytona Beach event, one of the biggest races of the year. His carburetor was found to be illegal and Flock was stripped of the win. It probably shouldn’t have surprised NASCAR that Flock was running that unauthorized “fish” carb, as they were one of the sponsors on his car that day. In NASCAR’s very first top-tier event (then called Strictly Stock and apparently and they meant it), Glen Dunnaway took the checkered flag at the wheel of his ’47 Ford, but he too was disqualified. Someone on his team had driven a wedge of wood in between leafs of the rear leaf springs, effectively stiffening them and making them better able to handle the incredibly rough and rutted conditions at Charlotte Speedway. But when you hear about a pit crew member today using an wrench to “put a round of wedge in it,” they’re doing the same thing Dunnaway’s pit crew member did, effectively increasing the rate of the spring. So when you read somewhere that NASCAR is going to start disqualifying drivers for rules infractions for the first time ever, remind them about what happened in the very first NASCAR Cup race ever! It seems cheating and auto racing have a long sordid history. The late Mark Donahue even wrote a book about it and his years with Penske racing on the Trans-Am series called “The Unfair Advantage,” which is about as nice an euphemism for “cheating” as anyone has ever come up with. Perhaps cheating is just endemic to racing. Even the annual soapbox derby race had its own major cheating scandal. Under the rules a soapbox derby car has to rely on gravity alone. In the 1973 event, a lad by the name of Jimmy Gronen got disqualified. We’ll presume it was his dad or someone else with a toxic case of Little League Syndrome who came up with the idea of installing an electromagnet in the nose of that boy’s Soapbox Derby car. When the metal starting gate dropped, the magnet helped pull the car forward, given young Gronen a head start on his legal competition who were still depending on Isaac Newton and pals. But in order for the magnet to work Gronen had to push back on his headrest with his helmet to close a micro-switch to power up the electromagnet. So maybe NASCAR hasn’t disqualified a rules breaker for a while and maybe they will in fact take away a cheating driver’s trophy, paycheck, fame and points, but will they be able to send that driver to bed without his dinner, too? Well this move makes perfect sense, logically. Now I have no doubt NASCAR will screw this up and not apply “the rules” evenly. I don’t trust them, I just don’t. Tis their own fault! I am glad that they have finally acknowledge this issue and will disqualify cars that strayed far beyond the lines. It’s about time. I just know that at some point they will screw it up and we will all be complaining about their enforcement at some point. The more money involved the more cheating pays off. This will hopefully get rid of some of the worst cases but when those last races of the regular season start getting close, there is still a huge incentive to try to get one by the inspectors. So we’ll see how it works out. I also don’t think 90 minutes will be enough but it’s a start. I hadn’t heard about the nitrous in DK’s car before. Gonna go do some research. Check out Marty Robbins using nitrous. do they still have the room of doom and gloom at daytona, where they’d display all the illegal parts they confiscated leading up to the 500? That room should include all of Knaus’ cars. 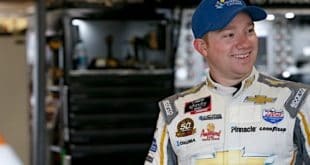 DoninAjax – i keep waiting for something to be said about the 24 car on the pole, especially since knaus is that crew chief now. 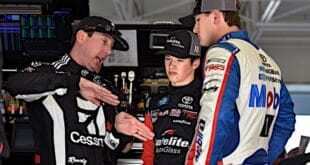 What did Johnson say after he took out Truex at Charlotte? Maybe they moved the room of doom and gloom to HMS headquarters LOL. Best article in a while Matt. I agree. I don’t think NASCAR can run a comprehensive inspection of three cars in 90 minutes. I also don’t trust their impartiality. One question. Wasn’t Paul Van Valkenberg the author of “The Unfair Advantage”? This is a picture of the original cover of Unfair Advantage. It’s BY Mark WITH Mr. Valkenburg. In the Trans Am era, Mark and Roger Penske’s race shop was about a ten minute bike ride from my parents home where I lived (I was in grade school) I used to go hang on that fence watching everything that was going on until they’d chase me off. (or occasionally buy me a Coke. How secretive were they sometimes. They wouldn’t let a 10 year old take pictures through the fence) One of my neighbors dated Mark while they were in high school and they remained friends. and I get to meet Donahue through her several times. He was a genuinely great guy and a very versatile and talented driver. Excuse the bad memory, feel bad not giving Donahue credit. He certainly was a favorite of mine in the TA days. Surprising since I never was a Penske fan. I still harbor a grudge toward he and Pat Patrick for the forming of CART. Always felt it was the major factor in the decline of Open Wheel as we knew it in USAC days. Good article, Matt. In Army basic training my DI said “if you ain’t cheatin’, you ain’t tryin'”. For 2019 I’ve decided that I will hit as many local dirt & asphalt tracks as I can in my little corner of Dixie. Welcome to 2019 Matt! I agree that this is overall a good change. I am also sure NASCAR will screw it up!